Early in 1982 the Ovation retailers received brochure (this, front and back) with a young Bill Kaman (scion of the great Charlie) showing off his awesom cowboy boots and holding a magnificent, shocking blue, magnificient acoustic Ovation. 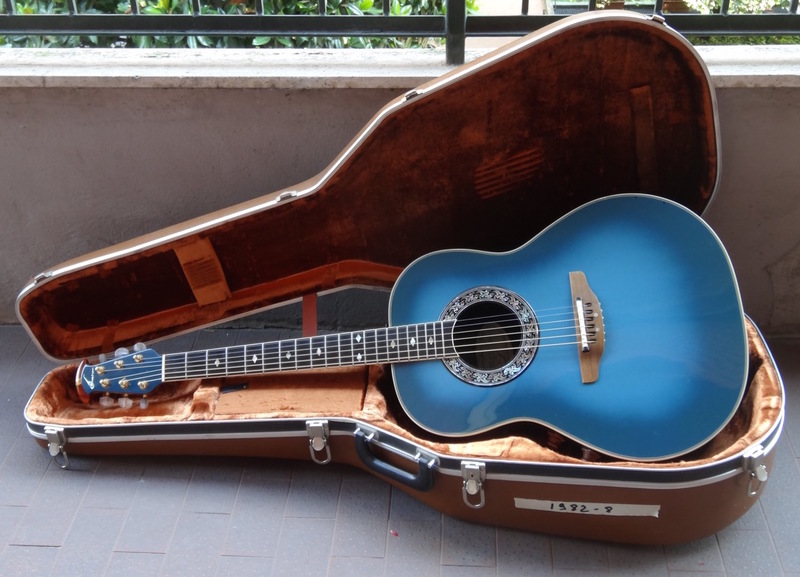 The guitars was the first star in the Ovation Collectors Series, a line of limited edition instruments that – year after year – tickled the finest palates until 2010. Somebody sicker than me had the courage to follow Bill in his happy madness for a quarter of Century, buying all the Collectors year after year. I just bought my favourites, including this 1982, first of the series, that stunned me from the first moment I saw it on the ad. Basically it’s a Legend hotrodded with an ebony fretboard, abalone inlays, Adamas stereo electronics and a striking blue soundboard with matching headstock. The guitar is in fine original condition with a clean original brown case. It is on the heavy side and after playing it a while it came to life, becoming one of my favourite guitars, thanks to a clear voice and an even frequency response. The neck is perfect, so I can set a very confortable action. I love the look with the two Adamas-style wood pots. Found in march 2014 in Allen Park Guitar Center. Thanks Dan!